THE winner—all of 'em! The six projects shown on these pages were the best Workbench Award entries received during the month. 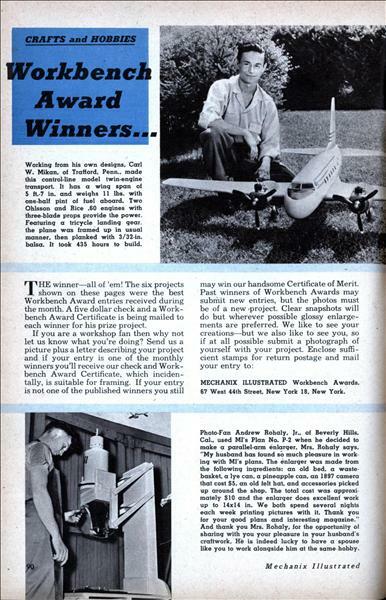 A five dollar check and a Workbench Award Certificate is being mailed to each winner for his prize project. If you are a workshop fan then why not let us know what you're doing? Send us a picture plus a letter describing your project and if your entry is one of the monthly winners you'll receive our check and Workbench Award Certificate, which incidentally, is suitable for framing. If your entry is not one of the published winners you still may win our handsome Certificate of Merit. "One of the best dollar values today," says Tom McCahill. 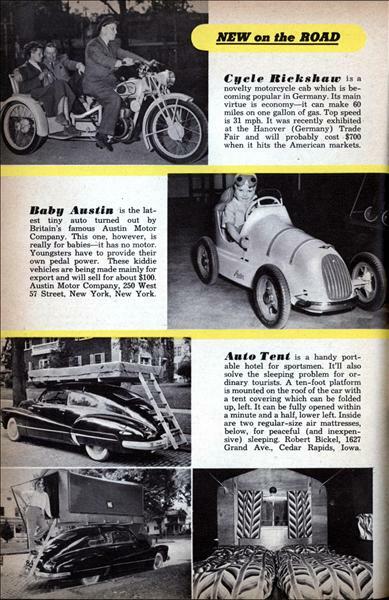 They're not the fastest cars on the road but they're tops in comfort and quality. 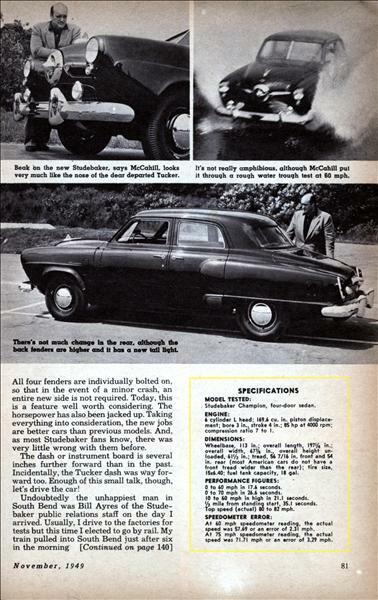 THE new, needle-nose Studebaker gives the boys of the Big Three something to shoot at. 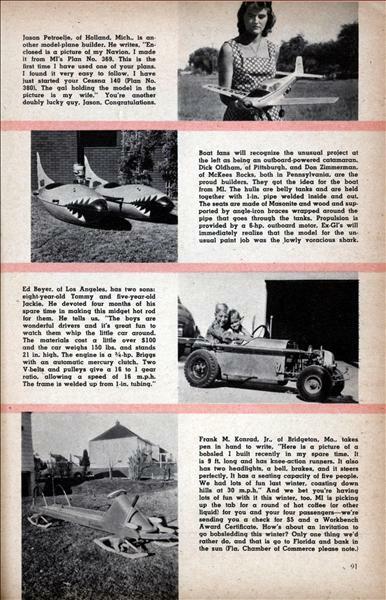 Back in '46, with the introduction of the 1947 Studebaker designed by Raymond Loewy, this first real post-war auto stirred up the populace. 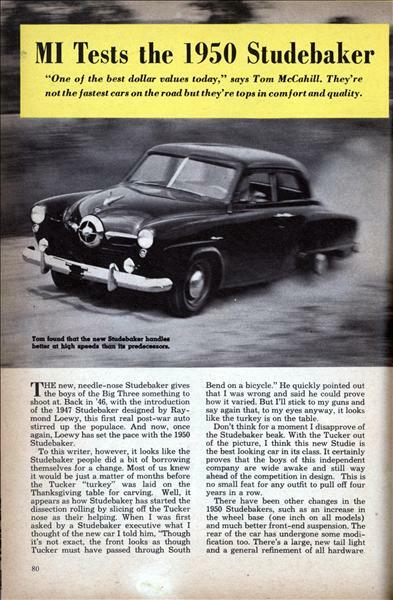 And now, once again, Loewy has set the pace with the 1950 Studebaker. 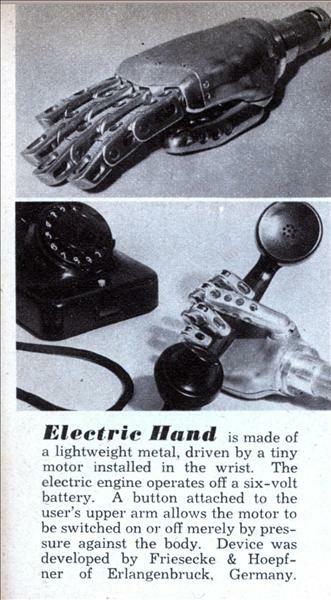 Got a new gadget? 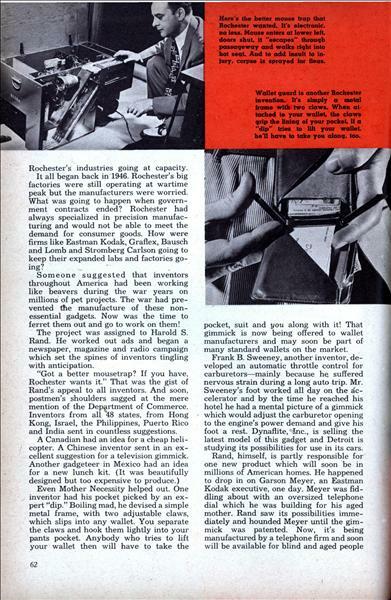 Rochester's industries want to see it. 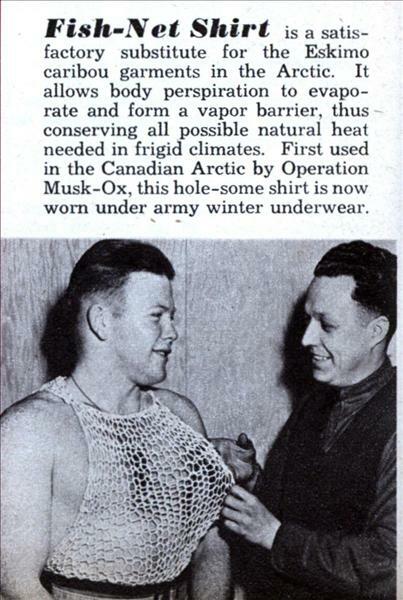 They may even make it and market it for you. 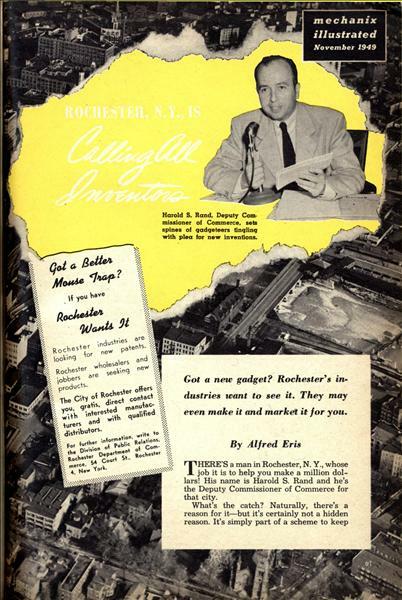 By Alfred Eris THERE'S a man in Rochester, N. Y., whose job it is to help you make a million dollars! 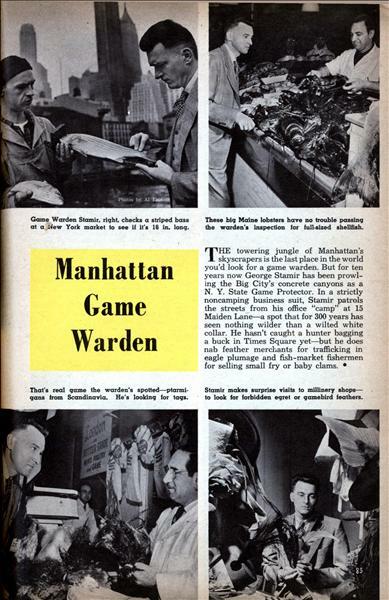 His name is Harold S. Rand and he's the Deputy Commissioner of Commerce for that city. What's the catch? Naturally, there's a reason for it—but it's certainly not a hidden reason. It's simply part of a scheme to keep Rochester's industries going at capacity. People who like phonograph music are getting dizzy trying to keep up with three different systems of playing three sizes of disks. 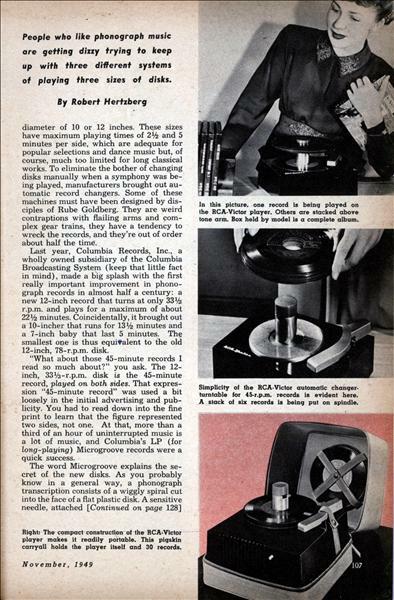 By Robert Hertzberg BUYING phonograph records used to be a simple and painless operation. You could walk into any music shop and say, "I want a few of the latest dance tunes for a party." 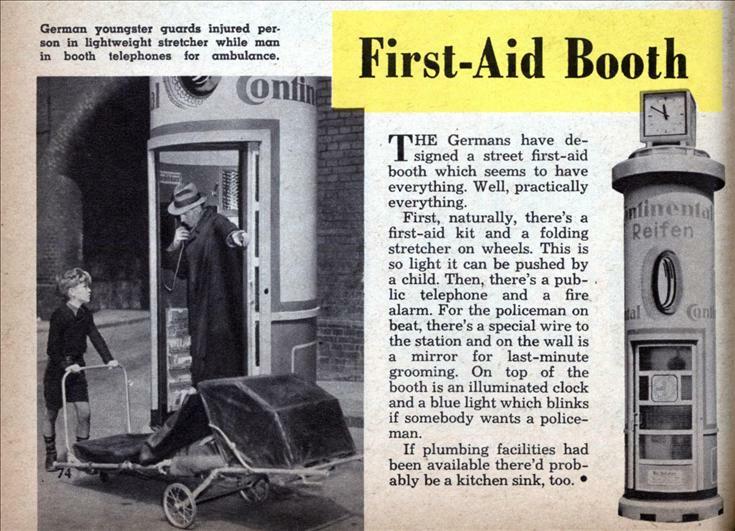 You'd depart in a few minutes with a neat bundle under your arm. But not any more! "Phonograph records? Yes, sir," the clerk now says. "Would you like 10- or 12-inch records for a 78-r.p.m. turntable, or 7-, 10-, or 12-inch records for a 33-1/3 r.p.m. 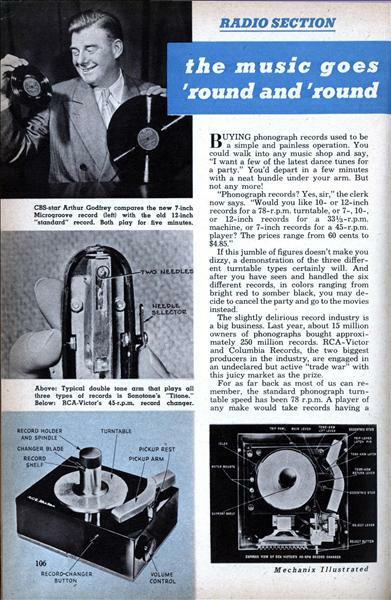 machine, or 7-inch records for a 45-r.p.m. player? The prices range from 60 cents to $4.85." GAR Wood, the silver-haired king of speedboat racing, has designed the most stable boat in the world. 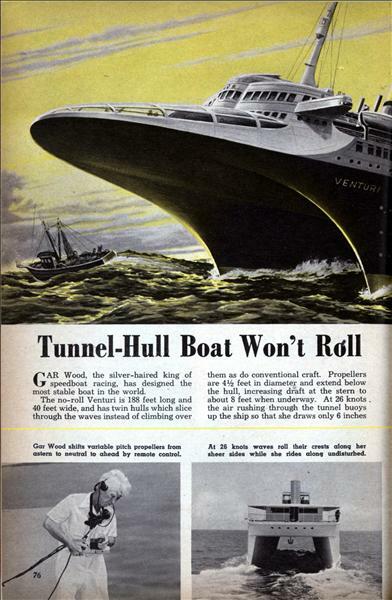 The no-roll Venturi is 188 feet long and 40 feet wide, and has twin hulls which slice through the waves instead of climbing over them as do conventional craft. 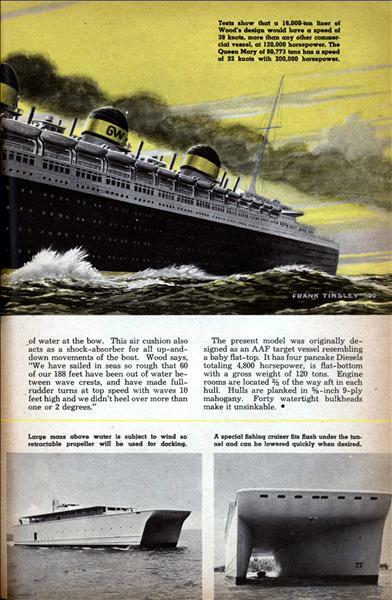 Propellers are 4-1/2 feet in diameter and extend below the hull, increasing draft at the stern to about 8 feet when underway. 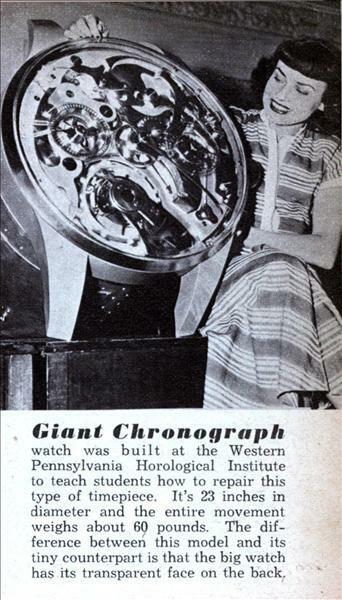 Giant Chronograph watch was built at the Western Pennsylvania Horological Institute to teach students how to repair this type of timepiece. It’s 23 inches in diameter and the entire movement weighs about 60 pounds. The difference between this model and its tiny counterpart is that the big watch has its transparent face on the back. 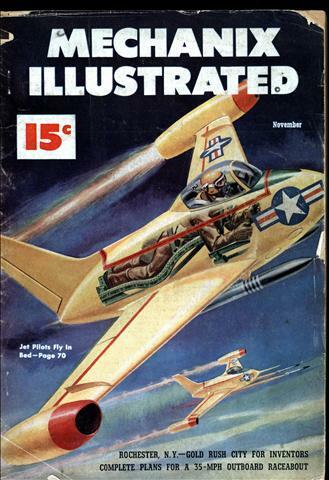 THE United States Air Force is putting its flyers to bed so that they can't go to sleep! If that seems sort of cryptic to you, be assured that it should. 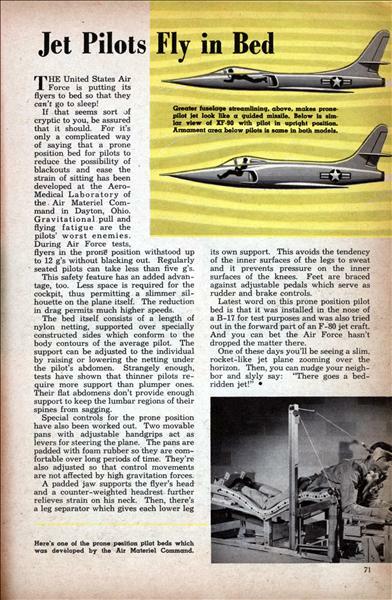 For it's only a complicated way of saying that a prone position bed for pilots to reduce the possibility of blackouts and ease the strain of sitting has been developed at the Aero-Medical Laboratory of the - Air Materiel Command in Dayton, Ohio. 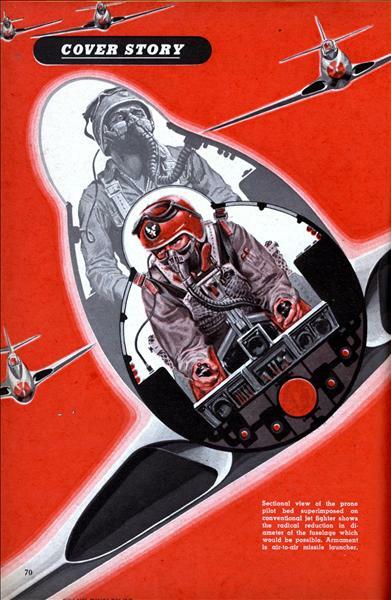 Gravitational pull and flying fatigue are the pilots' worst enemies. How to transform your baby's first pair of walkers into a permanent keepsake. 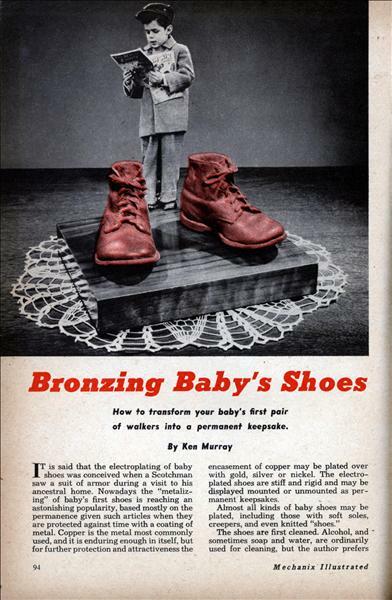 By Ken Murray IT is said that the electroplating of baby shoes was conceived when a Scotchman saw a suit of armor during a visit to his ancestral home. 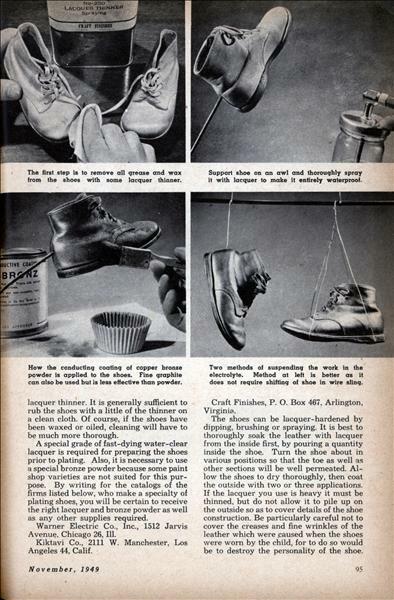 Nowadays the "metalizing" of baby's first shoes is reaching an astonishing popularity, based mostly on the permanence given such articles when they are protected against time with a coating of metal. Copper is the metal most commonly used, and it is enduring enough in itself, but for further protection and attractiveness the encasement of copper may be plated over with gold, silver or nickel. The electroplated shoes are stiff and rigid and may be displayed mounted or unmounted as permanent keepsakes.